Mexico city rudo. 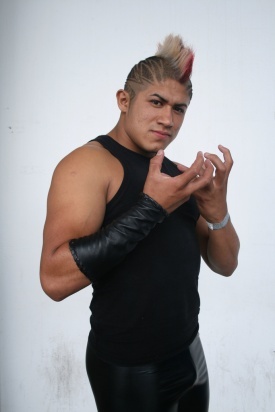 Started out in small arenas (like Coliseo Coacalco, gaining attention for a long feud with with Daga. The feud took them both to IWRG. Daga has floated around to other indies, while Eterno has stuck in IWRG and branched out to DTU. Eterno was leader of DTU's Los Mazisos, but left to join Familia de Tijuana. Has made scattered AAA appearances since mid 2013. (1) cage match w/Alan Extreme, Carta Brava Jr., Dragón Celestial, Imposible, Saruman, Serpiente de Oro, Violencia Jr., Boycot, Flehizer, Kiuby, Konkreto, Mr. Leo, Rey Tabú, Vuelo Espacial; (2) cage match w/Texano Jr., Villano IV, Trauma I, Trauma II, Super Nova, Chessman, Daga, Cien Caras Jr. This page was last edited on 9 April 2019, at 16:27.